A short drive from McCain mall in Little Rock will bring you to a quiet, tranquil place that looks like something from an old movie. As a matter of fact, it was featured in the opening credits of "Gone With the Wind." It's believed to be the only remaining structure from that film. No matter the explanation, you can come for a visit to learn more about this historical mystery. The Old Mill is in the Lakewood area on Lakeshore drive. Take McCain Boulevard East and you'll see Lakeshore which has signs pointing you to the Mill. Admission to the Mill is free and visitors may tour at their own pace. It is open from dawn until dusk. This is a fairly safe neighborhood, but take the usual precautions if you come alone. Arkansans use the Old Mill, also known as Pugh's Old Mill, for many outdoor activities. On a nice spring day, you're bound to find people picnicking, children laying in the grass or playing in the water and perhaps even weddings or photo shoots. Many people choose the Old Mill as a place to hold their nuptials and many schools around North Little Rock have their school photos taken there. Guided 30-minute tours are available for groups of 10 or more people, with advance reservations and are conducted by trained volunteers by calling 501-758-1424. The Old Mill is not actually as old as it appears. 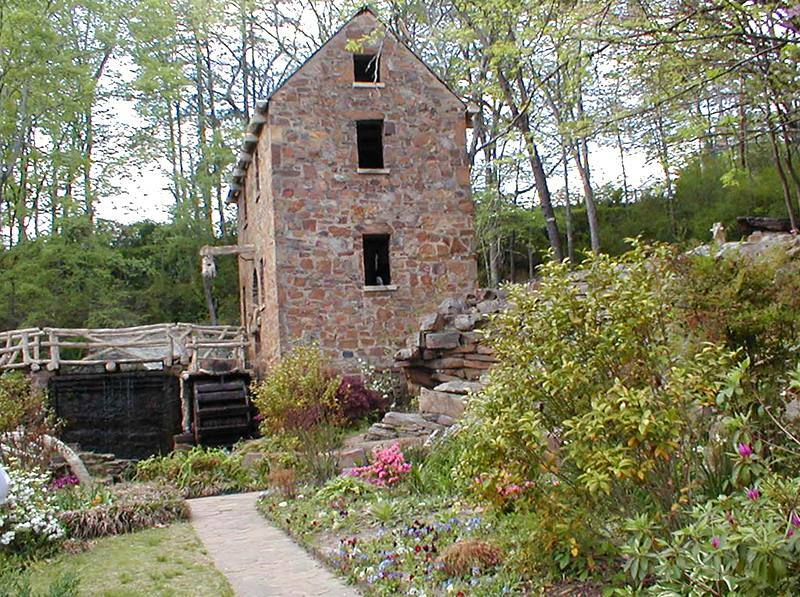 In 1933, Justin Matthews contracted for the construction of a replica of an old water-powered grist mill. He did not set out to copy any preexisting mill but instead chose to design something that would fit the contour of the area. He wanted the mill to appear as if it belonged in Arkansas and had been here since the 1800s. The Mill is intended to appear neglected, just as old mills that were in service in the early 1800s had become by the 1930s. Even though the park looks natural, and like it was constructed with vines and bark, most of the decorations are concrete. The park is decorated with sculptures of toadstools, tree stumps, and a tree branch-entwined bridge that connects the mill to the rest of the park. Senor Dionico Rodriguez, a sculptor and artist of Mexico City, was responsible for all the details of each piece of concrete work made to represent wood, iron or stone, as well as the designing of the footbridges and rustic seats. During the summer of 1991, Rodriguez's work at the Old Mill was renovated by the great-nephew of the original artist, Carlos Cortes.